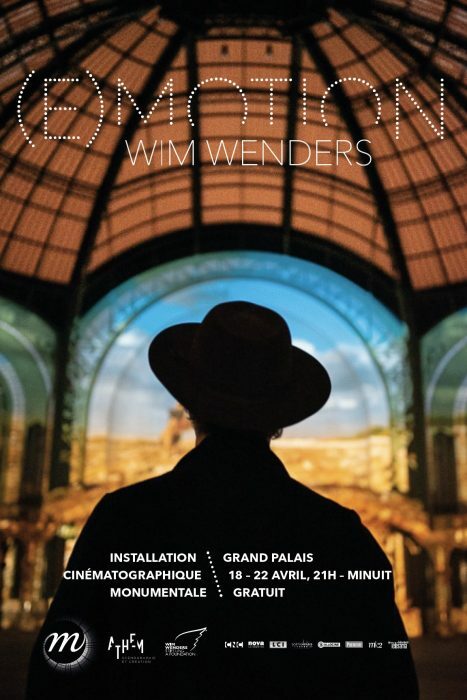 Neither a work of video art nor an artist’s film, this cinematographic visual creation is an original and spectacular proposal to ‚exhibit‘ Wim Wenders’ cinema as first and foremost an artistic object – in the sense that Henri Langlois spoke of cinema „as a plastic art and not a dramatic art“. The plastic aspect of cinema is in the editing. The unique work that Wim Wenders has created for this event is thus an unprecedented montage based on images from his own films, free from any narrative framework and focused on his aesthetics. The white screen of the cinema will be replaced by the grand architecture of the Nave of the Grand Palais: watching a film becomes an immersive experience rather than a two-dimensional one.